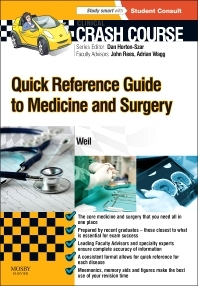 Crash Course Quick Reference Guide to Medicine and Surgery is a unique new volume in the series, spanning the core clinical topics across the medical curriculum. It is as useful for your first day as a clinical medical student as it is for preparing for your medical finals and beyond. Presented in a consistent format that is clear, concise and easy to assimilate, it is an essential text for any medical student or junior doctor. Dr Leonora Weil qualified as a doctor in 2009 from The Royal Free and University College Medical School in London. She has a degree in Natural Sciences from Cambridge University and a Masters in Public Health from the London School of Hygiene and Tropical Medicine. She currently works in Public Health and has an ongoing interest in Medical Education.